A type of charcoal iron was used in China over a thousand years ago. The example illustrated here was produced in the 19th century and may have been manufactured in Germany. 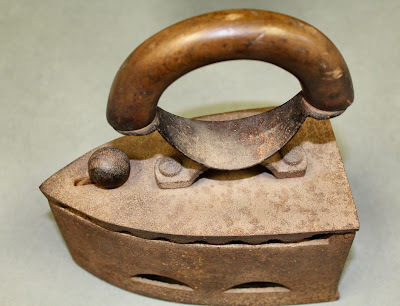 It is made of cast iron with a wooden handle and a hinged lid. The charcoal iron was heated by burning charcoal within the hollow body, with the fumes escaping through holes on each side. The iron had to be moved back and forth in order to keep the charcoal embers burning.